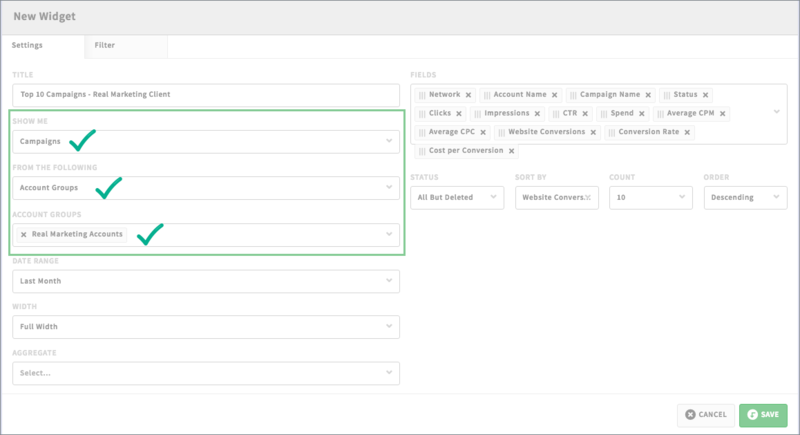 Now you can choose to view data from specific account groups, accounts, folders, campaigns, ad groups, or ads at the dashboard level by setting a 'Data Source'. Learn how to set a default data source for your dashboards here. Let's say I notice in my weekly social report that Client A's LinkedIn account is out performing both their Twitter and Facebook accounts in website conversions. 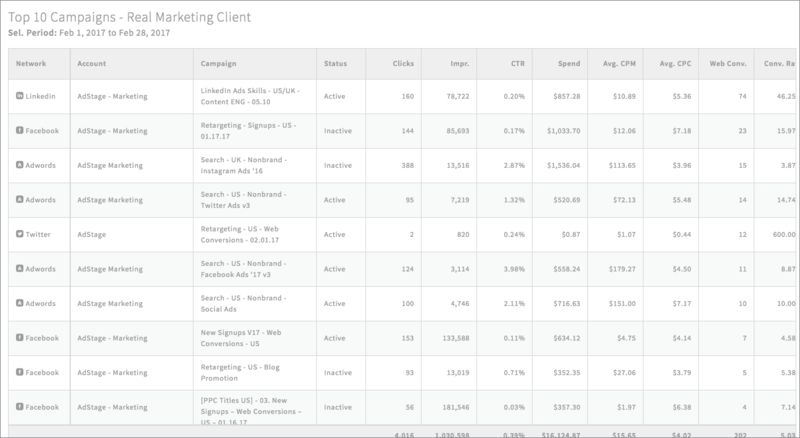 I want to create a table of the top 10 campaigns from Client A's LinkedIn account. 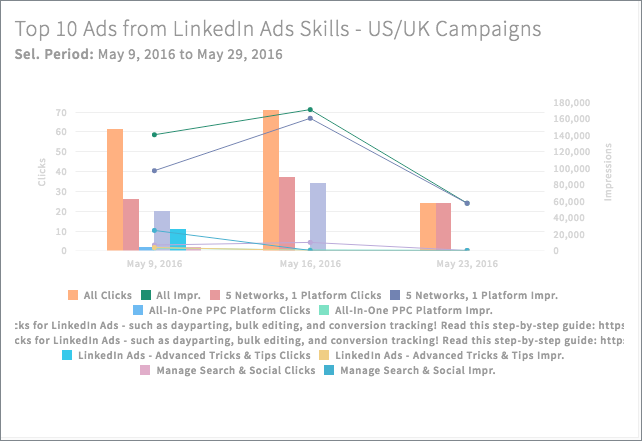 I see that the top performing campaigns are "LinkedIn Ads Skills - US/UK - Content ENG" and "MKT Role LinkedIn Ads Skills - US/UK". Using a bar/line chart -- I want to see the top 10 ads from those campaigns to see a side-by-side comparison of impressions vs. clicks. 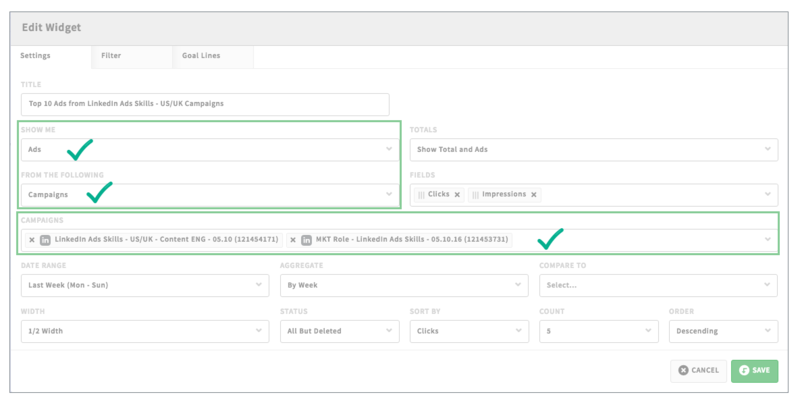 Campaigns = "LinkedIn Ads Skills - US/UK - Content ENG" and "MKT Role LinkedIn Ads Skills - US/UK"
You've already grouped your Accounts into Account Groups and organized your campaigns into Folders (awesome!) for cleaner management and reporting views. Now you can get an even more granular view of campaign, ad group, ad, or keyword performance within a specific Account Group or Folder. We always love hearing from you! If you have any questions or feedback about the newest Report features, shoot us an email at support@adstage.io :).